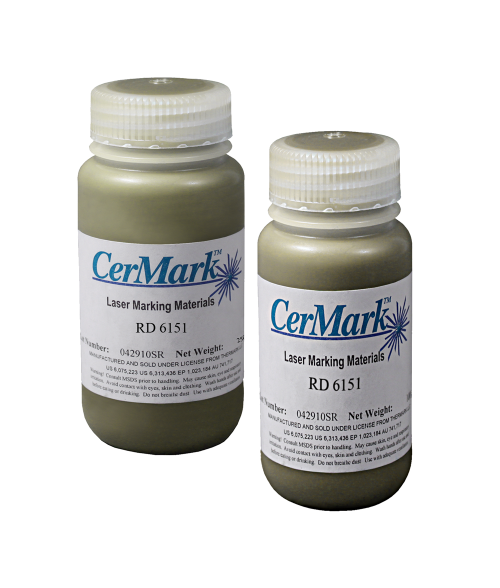 The CerMark Bright Copper for Metal expands the applications for metal marking and works in much the same way as the well known CerMark Black color. The Bright Copper color has a metallic finish that sparkles and adds flair. This very special compound requires spraying on to the metal using an air brush, small cup sprayer or the LaserBits Spray-Tool Kit. The metallic nature of the Bright Copper will not allow it to be brushed on. Once sprayed on to bare, uncoated metal, engrave using the same power and speed settings used for the CerMark Black color to fuse the coating on to the metal. After engraving, wash with water to remove the unengraved coating. The results are outstanding and equally as durable as the Black color. The 100 grams of solution will cover an estimated 1000+ square inches. This metal marking compound is compatible with Co2, YaG and Fiber lasers and produces high contrast marks on a wide range of metals including stainless steel, aircraft grade aluminum, chrome and many more. Available in 100g and 250g bottles.